IT’S ONE OF THOSE SHIMMERING SWEDISH afternoons when everything seems to glow from within: the boathouses on the harbor, all pulsing vermillion red; the wind-rippled bay, glittering like a million suns; and the chalk-white houses of Fjällbacka, luminous under the Nordic sky. Laughter and ship’s bells echo off the marina. You could walk a half-mile out to sea just by hopping across the schooners and yachts that crowd the harbor. (In West Sweden there’s a boat for every man, woman, child, and dog.) On the sunsplashed deck at Restaurang Matilda, a rowdy crew is singing Swedish folk tunes, knocking back cumin-y schnapps, and ripping into platters of crayfish. There’s hardly any spcce on the tables, and barely enough room to move. If you are Swedish you will register this scene with deep satisfaction—and also, perhaps, a twinge of anxiety. For remember where we are: in Sweden, summer blazes through like a comet, hot and bright and ungodly fast, then abruptly disappears again. For ages. Even at the hopeful crest of midsommar, in the back of the Swedish mind, every blessed gain—in temperature, in daylight, in crayfish—must be reckoned against impending loss. And so it is that, around the third week of June, the entire country is catapulted into a joyful panic. That’s when Swedes begin their great waterbound migration—to vast inland lakes, fast-flowing rivers, silvery ponds full of pike and trout, and, especially, to the coasts. “Everyone leaves town for their second home or seaside caravan,” says Ekstedt, “and the cities basically shut down.” This nationwide delirium prevails until mid-August, when the kids go back to school: all of Sweden soaking up as much water and sunshine as precious time allows. As the grandson of Swedish immigrants (and a former New Englander) I was well-acquainted with the rites of midsommar, and the unhinged glee that accompanies that too-brief reprieve between winter and…more winter. Growing up, I’d embraced a similar ritual across the Atlantic, on the coast of Maine, where summer days were measured in frigid saltwater dips and lobster-roll lunches. But it was the cajoling of my pal Marcus Samuelsson—the Swedish-American chef, who spends part of each summer in his family’s ancestral home of Smögen—that inspired a return to the source. With Marcus as my occasional cohort, last August I traced Sweden’s Bohuslan Coast in that same familiar, happy panic, bent on wringing every drop from summer’s quickly receding tide. I would rise at 5 a.m. for sunrise kayaking; spend every golden hour outdoors; and linger, like the sun, late into the evening, until the last of its rosy aura had vanished from the midnight sky. In contrast to Sweden's leeward east coast—gentle, verdant, refined—the western county of Bohuslan is raw and wind-lashed, showing more granite than green. If you’re accustomed to the pine-covered Stockholm Archipelago, it can feel like another country. And it is, sort of. Conflate coastal Maine with the more lunar landscapes of Iceland and you’ll have a fair picture of Bohuslan. Bohuslan’s resort towns may be superficially interchangeable, but there are subtle variations—primarily, the favored local catch. 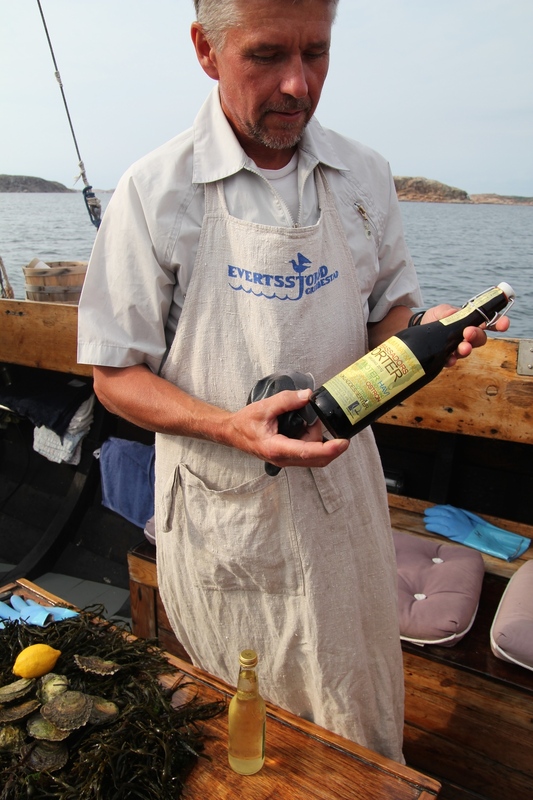 There’s Lysekil, to the south, with its distinctly nutty, umami-rich mussels. Grebbestad, in the north, with its celebrated oyster trade. 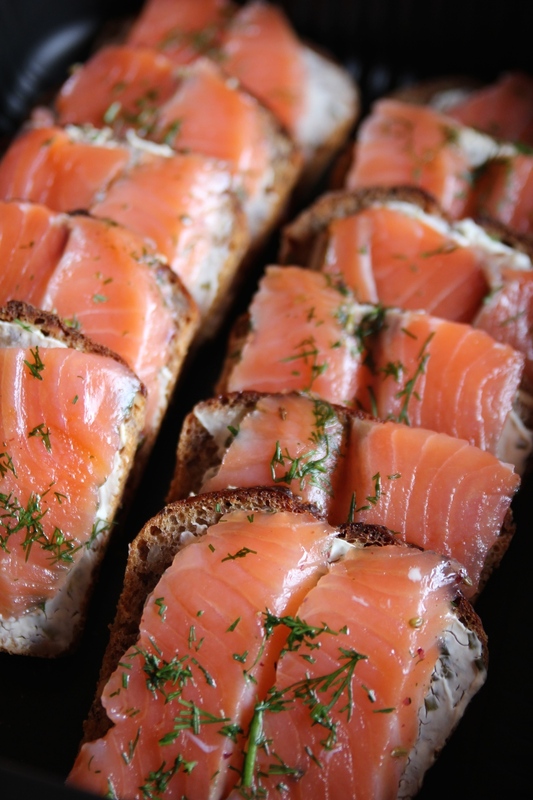 And Smögen, midway between, renowned for its sweet, rose-colored shrimp (sold in Stockholm and Göteborg markets as Smögenräkor—an appellation as prized as Maine lobster or Maryland crab). Fjällbacka, the prettiest of these communities, is known less for fishing than for two famous former residents. Ingrid Bergman called this corner of Sweden “my place on earth,” and kept a house on an island off Fjällbacka from 1958 until her death in 1982. There’s a bronze bust of the actress in the town square, which is named for her. Bergman may have her statue, but whole walking tours are devoted to native daughter Camilla Låckberg, the crime novelist, whose sales in Seden have outpaced Stieg Larsson’s. All eight of her books are set, improbably, in this sleepy town of 900 (the summer population swells to 15,000). I’ve read a few of Låckberg’s mysteries, and her imaginative gifts seemed all the more impressive when I saw Fjällbacka in the cheerful light of day. Really? This place? Far from Låckberg’s sinister town of secrets, it recalled a miniature village from a model railway. As I set out on my first morning, a line had already formed outside Setterlinds Bageri, an old favorite of Bergman’s, who made regular pilgrimages for moist, almondy Mandelberg cake. Setterlinds had me at their kardemummabullar: gooey, savory-sweet cardamom rolls that rivaled my grandmother’s. On the public pier, towheaded kids gobbled bags of gummy candy. (Swedes + gummy candy = everlasting love.) Handsome women and impossibly tanned men were hiking up the Vetteberget, the granite butte that juts 250 feet up from the center of town—it, too, looked like a train-set prop. On the gentler hillside above the harbor, cobblestoned paths wound up to the Gothic church, past cottages with red-tile roofs and the gingerbread trim known as snickarglädje or “carpenter’s delight.” Geraniums filled every window box, and the Swedish blue-and-yellow flapped on every other rooftop. This odd mix of harshness and grace—of wind-scarred rock and rosebushes—is what gives Bohuslan its stirring beauty. Its greatest assets, however, are found not on land but hiding underwater. 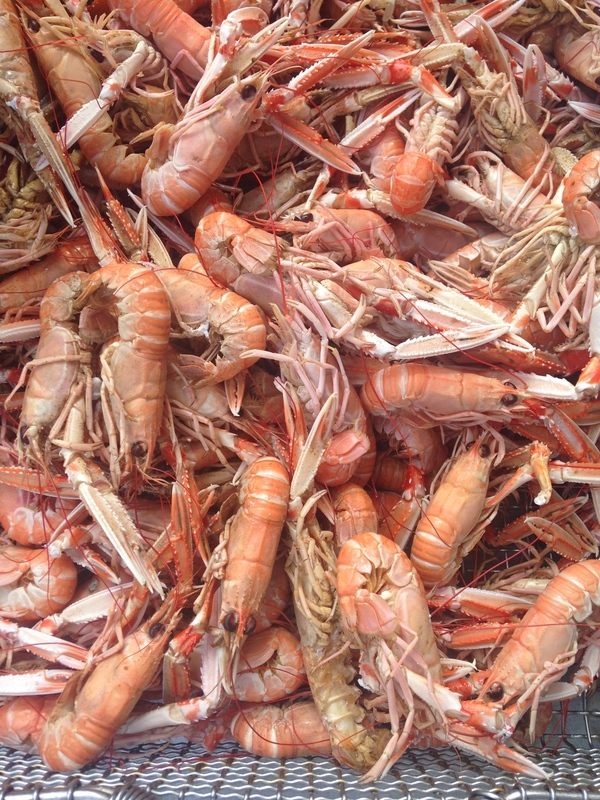 From these cold, clean bays and inlets comes some of Northern Europe’s finest seafood, not least the coveted Bohuslan saltwater crayfish, which are not actually crayfish, but plump, delectable langoustines. Their flavor is staggering, their abundance here obscene. And there’s plenty else in the sea: the aforementioned mussels, shrimp, and oysters, plus juicy stone crabs, the best I’ve ever tasted; cod and mackerel; and of course herring. In Bohuslan, the sea is everything. At shorefront snack bars, teenagers order hot dogs topped with shrimp and mayonnaise. If you’ve come—like me—to devour as much seafood as humanly possible, you’ll chart a course for Grebbestad. Sheltered by an archipelago of tiny, skipping-stone islets, the waters here are ideal fishing grounds—the source of fully half of Sweden’s lobster catch, 70 percent of its crayfish, and 90 percent of its oysters. I drove the hour up from Fjällbacka to spend the day and night in Grönemad, a minuscule fishing village just north of Grebbestad. “Village” is too strong a word: Grönemad feels like a Viking encampment on the edge of the known world. (I mean that in a good way.) If Fjällbacka is sleepy, Grönemad is downright comatose. (Also in a good way.) In 22 hours I saw more cattle—grazing beside the pebbly town beach—than people. Fortunately, two of those people were Per and Lars Carlsson, seafaring brothers who run oyster and lobster “safaris” out of their Grönemad boathouse, Everts Sjobod. The boathouse itself is 130 years old, and inside it’s still 1885: candlewax overflows from old brown beer bottles; kerosene lanterns rest on wooden barrels; knotty rafters are tangled with ropes and pulleys and fishing nets. On the dock outside, a flame-heated, seawater-fed hot tub makes you wish you could come back in winter. Almost. Last May the brothers added four modest rooms for overnight guests, with kitchenettes and IKEA furnishings and bright interiors clad in pickled pine. Per showed me to one of the smaller suites upstairs, whose best feature was a breezy rooftop terrace overlooking the bay. Then he took me out to harvest some oysters. This turned out to be easier than you’d think. From right outside on the boathouse pier, Per dipped his eight-foot oysterman’s rake into the water below, rummaged blindly in the seabed for less than 10 seconds, then hoisted up half a dozen shallow-cupped European flats, the size and color of sand dollars. A few more rakings and we’d filled our pail with several dozen. We layered on a blanket of cold seaweed, took the pail onto the brothers’ wooden fishing boat, and with Lars at the helm, chugged out into the bay. The coastline was gnarly and sea-gouged and fuzzy with moss; it looked like an oyster. Lars piloted us south toward Grebbestad, and we slipped into its busy marina. With Sweden’s largest fleet of independent fishermen, Grebbestad is still a working harbor town. Off-season the population drops to just 2,000 (from 20,000 in summer). “Only eight restaurants stay open in winter,” Per said. “But at least there are eight.” From Grebbestad we turned back north and moored off an islet where seals were basking in the afternoon sun. Per broke out the pail, handed me a knife, and we set to work shucking our haul. After twenty slurps I was buzzed on porter and oyster liquor. It was early evening, but the sun still hung high. “So: back to the sjöbod?” asked Lars, knocking back one last half-shell for the journey. A word about the language. My grandparents did their best to teach me some Swedish as a kid, and I’ve spent many hours since with various language apps, all in vain. It is an ornery bear of a language. Vowels and consonants look one way on the page yet sound entirely different. Take, for instance, sjöbod, the Swedish word for boathouse. 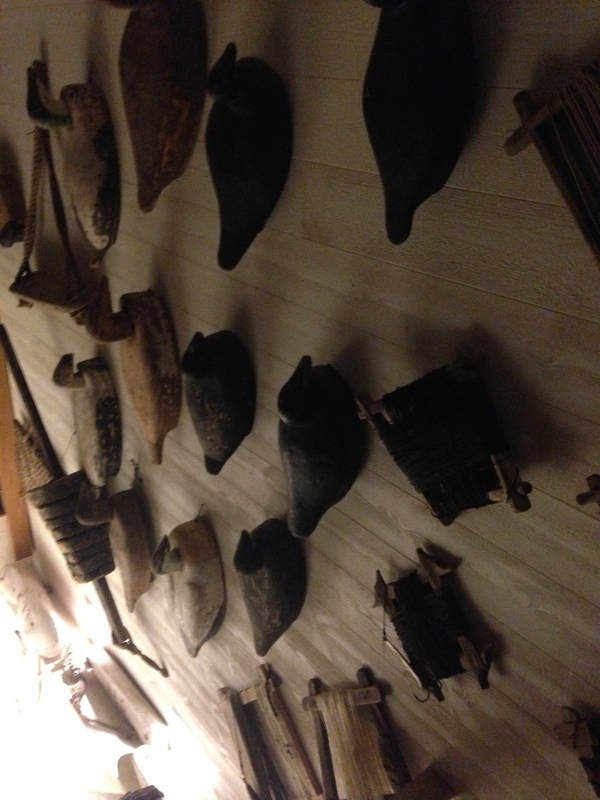 Coming from a Grebbestad fisherman’s lips, the first syllable—sjö, for “sea”—is like a North Sea wind whooshing through a drafty window: “Hshhweyyyyy.” The second—böd, for “house”—is swallowed tighly shut, like an oyster clamping its shell. Together they form a sound I cannot for the life of me replicate, even after asking Per and Lars to repeat it, slowly, a hundred times. Later that night, back at the sjöbod I couldn’t pronounce, the sunset had painted everything crayfish-pink. It was 9:55 p.m., and I sat on my rooftop terrace reading Låckberg’s The Stone-Cutter. A Fjällbacka girl had turned up drowned (murdered? ), her corpse entangled in a lobster trap. Just then I heard a scream, followed by a splash. I glanced up the shore. On the public pier, kids were somersaulting into the bay. It was a Swedish family, savoring the last of the evening’s light. Their laughter pealed across the water. This looked too fun to miss. I changed into my swimsuit, bounded downstairs, and leapt straight off the boathouse dock. The water was still and smooth as glass. When the light finally left, the family followed suit, disappearing across the cow pasture in the gathering dim. On the bay all was silent. Even the gulls had retired. (Nightswimming deserves a quiet night.) I floated for what felt like hours, till I could barely see the shore in the dark, then swam back to the sjöbod, toweled off, and tiptoed upstairs to bed. The next morning I was off to Smögen, where Marcus was waiting. Marcus is a proud son of Göteborg, but some of his best childhood memories took place 50 miles north, in Smögen, where his adoptive father was born. Here the Samuelsson clan would gather every summer, in a rambling, three-story Victorian owned by Marcus’s grandmother, who’d once run it as a boarding house. And it was here that young Marcus learned to fish and, not least, cook his catch—mackerel, crab, herring—under the watchful eyes of his father and uncles. (The chapter on Smögen in his memoir, Yes, Chef, is profoundly moving.) Marcus and his wife, Maya, now own a cottage here, just down the street from his late grandmother’s house. They return every summer, for a season of fishing, cooking, and feasting by the sea. Smögen—year-round population 1,400—is one of Europe’s great and enduring fishing towns. Its famous fish auction, founded in 1919, still operates twice a day. Smögen is also the headquarters of Abba, the seafood conglomerate and maker of Sweden’s beloved Kalles Kaviar (fish roe spread), whose retro blue-and-yellow packaging will be familiar to any IKEA shopper. There’s a playground in the heart of town with a slide shaped like a giant Kalles Kaviar tube. It was a bit less crazy now, in the wind-down days of early August, but still quite the scene. Though the dining rooms of restaurants were all empty, the dockside patios were jammed. (Given the chance, everyone eats outdoors.) We passed a café called Bremers, where a teenage Marcus had his first summer job, scooping ice cream and working the fryolator. “Man, I loved that job,” Marcus said with a wistful smile, stopping to watch the kids at work behind the same formica counter. We were walking with Karin Samuelsson, Marcus’s cousin, who runs a local summer-rental agency called Smögen Rum o Stuga (“rooms and cottages”). She and Marcus are almost old enough to remember when Smögen was known as an artists’ retreat, back when galleries and painters’ studios occupied disused boathouses. Then, in the 70s, came the discotheques. “Ahhh, the discos!” Marcus cried. “So great. One club took over this giant fish storehouse. Somehow it didn’t smell that bad—more like sweaty people than fish.” By the 1980s, Smögen had become a summer party destination for teens and twentysomethings—and remains so today, at least for the six weeks of peak season. Wearing yellow slickers, matching overalls, and heavy rubber boots, we set out with Martin and his crew to the crayfishing grounds, a few miles out to sea. Crayfish traps resemble lobster traps, and rest on the seabed about 150 feet down. Martin aimed for his telltale orange buoys, and with long hooked poles Marcus and I would reach over to grab the lines, then use a crank to hoist up the cages. Most held at least a couple of crayfish, plus the odd jellyfish or crab. (The latter clung tightly to the mesh, sharp claws snapping at our fingers.) Working fast, we’d empty the traps, rebait them with chunks of stinky herring, then stack them on the deck for later. It was tiring but thrilling work. After an hour we’d netted 63 langoustines. Good timing, said Martin: that morning, the market had hit a season high of $18 a pound. Earlier, on the sundrenched pier, I’d thought our thick yellow rain gear seemed excessive. Now, though, as the sky suddenly grew heavy with clouds, I could see what nine generations of Olafssons could teach a Lindberg about weather in West Sweden. The storm struck lightning-fast. We were just offshore, within sight of Smögen’s lighthouse, being tossed on huge swells as if in the heart of the Atlantic. Sliding across the rainslicked deck, careening into each other as the boat rocked and reeled, Marcus and I eventually managed to toss back all the traps. I’ve never been seasick; I came awfully close. Martin, meanwhile, stood smiling and steady at the wheel, secure in his element and his canary-yellow raincoat. He looked like Noah, or Walter White in his Breaking Bad meth suit. “Jag älskar sommaren!” Martin shouted to me and Marcus, flashing a crazy grin as a monster wave crashed over the hull.